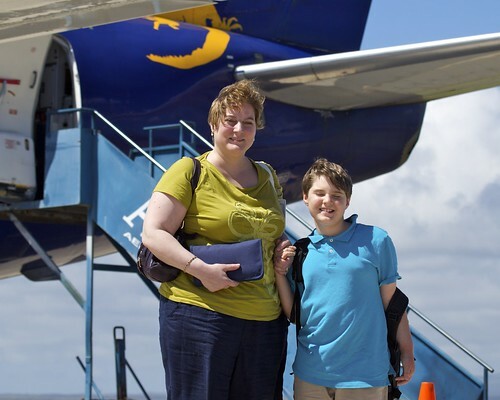 After nearly three days of travel (SF -> Miami (overnight) -> Quito -> Guayaquil (overnight) -> Baltra, Galapagos), we arrived in the Galapagos Islands Baltra Airport to a sunny, warm, late morning. Like almost all but the oldest islands in the Galapagos archipelago, Baltra is fairly flat with a central set of volcanic hills. The vegetation tends to be relatively low growing, the ground littered with volcanic rock and the place is generally inhospitable to mammals. Even at the airport, it was already readily apparent that the animal life of the Galapagos was utterly unique in its general lack of fear of people. 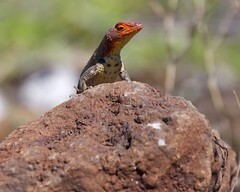 Waiting for customs, we were greeted by a handful of lava lizards, finches, and a Galapagos locust or two. Save for the locust, the critters were far, far, more concerned about territorial rights amongst their peers than they were of us. 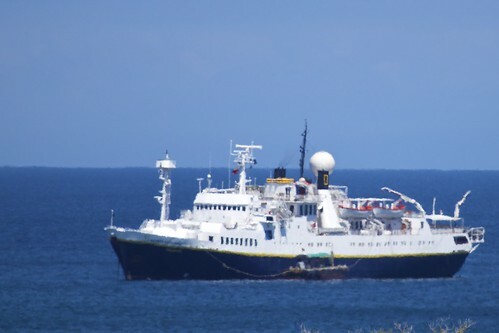 We then took a short bus ride to the Endeavor, the National Geographic / Lindblad ship that would be our home for the next week. Photo aside (there’ll be a lot of these):Along the way, I took a photo of the ship out the bus window. The bus was a good 1/2 mile — maybe 2/3rds — from the boat when I took this photo. It was hot and humid and there was considerable heat haze in the air. As a result, the full sized image of the boat looks more like a watercolor than a photograph! Neat! After being greeted by the crew, a nice lunch, and safety orientation, we spent the afternoon hiking around North Seymour Island for our first real encounter with the amazing wildlife of the Galapagos. This entry was posted on Sunday, May 2nd, 2010 at 4:37 pm	and is filed under Photography, Travel. You can follow any responses to this entry through the RSS 2.0 feed. You can leave a response, or trackback from your own site.